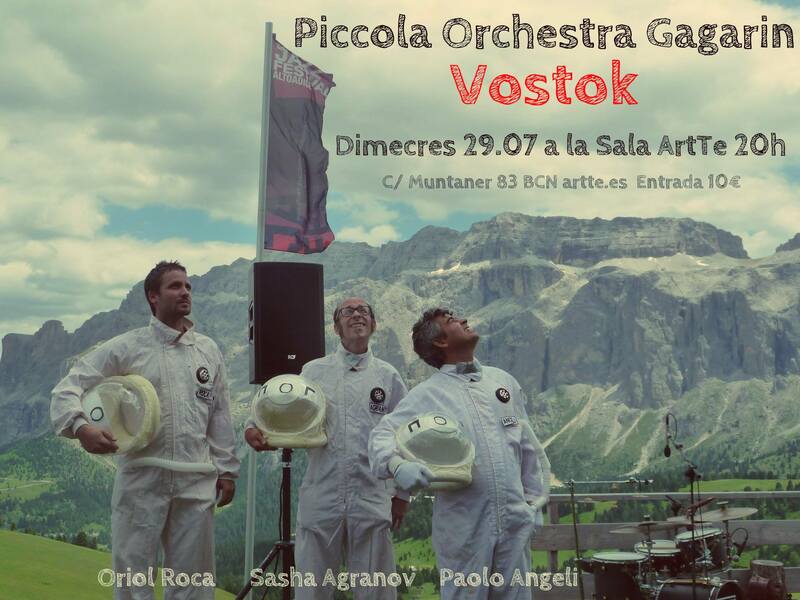 Piccola Orchestra Gagarin are a peculiar outfit. 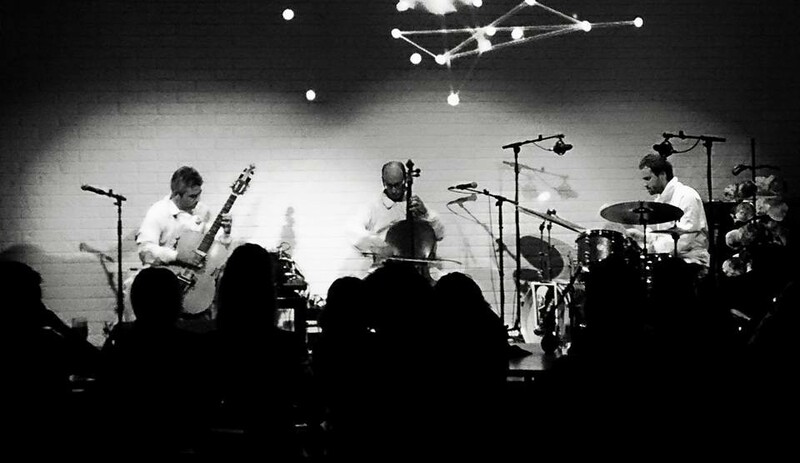 An Italian-Russian-Catalan trio with unusual instrumentation, pairing a cello with a guitar that has been practically turned into a cello (on steroids) plus an agile and inventive percussive approach that goes beyond the simple drumkit. As for musical style or genre, I’m not sure the right phrase has been coined yet (and probably shouldn’t be) but some of the base ingredients are free jazz, classical, film scores, mid- to east-European folk, and even 80s pop… the nuances are infinite. There’s also a distinct sense of humour at play, as embodied in the spacesuits (worn even by Angeli who is rarely seen in public without his trademark horizontally-striped top). Add to this the impressive visuals by Merlí Borrell (a constantly-evolving backdrop including Gagarin’s flight, news footage and other more abstract visuals) and we have quite the spectacle. Don’t get me wrong, it’s always the music that’s of paramount importance, but it’s undeniably nice to see the occasional bit of showmanship; apart from anything else, it indicates that those on-stage care about the audience experience. We begin with Angeli tapping at the guitar strings with a bow, setting up a percussive rhythm. Agranov begins a melody and Roca provides shimmering accents with bells, bowls, and cymbals. In one way, this sets the roles: the cello tends to lead the tune, the Sardinian prepared guitar provides quirky (yet musically spot on) melodic and harmonic flourishes and accompaniment, and the drums and percussion adds incredible richness and texture to the sound picture (while also keeping time, of course). Yet in another way, there are no clear roles; it’s like watching a trio of musical acrobats on the trapeze – they swing back and forth, without a net, throwing themselves into space, trusting and knowing that they’ll be caught and will catch in turn, and nobody ever, ever falls. It’s a lot of fun to watch and listen to, and there’s a distinct impression that every performance is unique. There’s a lot of what seems to be (and surely is) improvisation and spontaneous interplay, but there’s never any lack of ‘tune’; there is form even in the freedom. Each piece, each section has a clear structure, making for a listening experience that’s both accessible and challenging at once. Each tune merges with the next and there’s not a lot of stopping for applause. 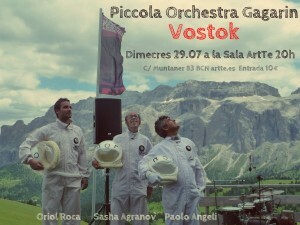 Some of the already-lost moments included: a distorted guitar riff combined with a kind of cello oscillation while Roca uses bags of pebbles to play the skins; a double arco frenzy on guitar and cello with some vigorous ‘malleting’ of drums muted with a cloth; angular and dissonant guitar melody while the cello gives up a swinging bassline and the drums play tricks with time… Finally, the encore tune raised yet another smile – as the strings slurred and twanged, the drums subtly lurched and it occurs that it wouldn’t out of place in a set by a Rain Dogs era Tom Waits; that was unexpected. Finally, a word about the venue. ArtTe is still fairly new (I think it opened just last year) but it has strong programme of live music and no wonder. The room is big, but not overcrowded. The decor is classy. The service is excellent. And Oriol Roca tells me they’ve invested in some decent quality sound equipment (borne out by what I heard!) Granted it’s pricey, 10€ a ticket may not seem much internationally, but you can find a lot of great music round this town for a lot less. However, it’s true that you get what you pay for and if you can bear to pay 4€ for a Moritz, then everything else is more than worth the cost of admission.